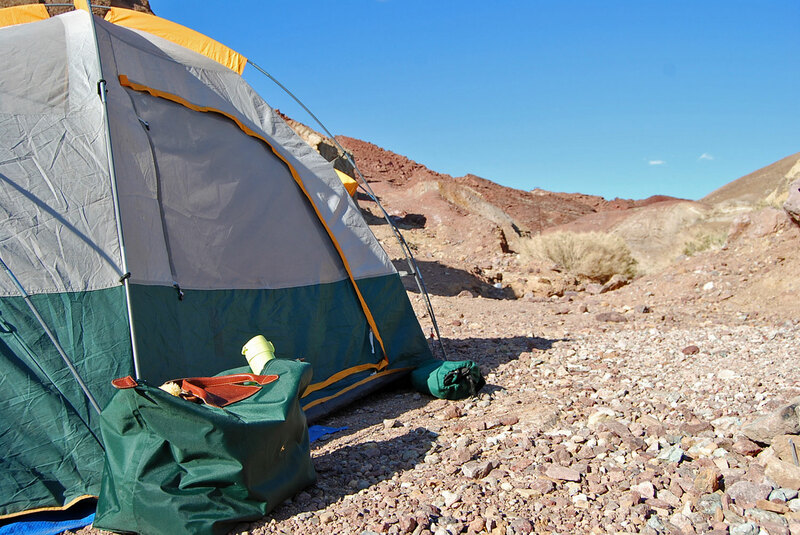 Recently I went on a camping trip with my son and a bunch of Boy Scouts to Calico Ghost Town. For those of you who aren’t familiar, Calico is a Historical Landmark located near the Mojave Desert in California. Nestled against the mountains, Calico was a silver mining town in the 1880s during the Gold Rush days. Today the old town has been restored as a tourist attraction, and visitors can go to see what an old western town used to look like. If you’ve ever driven the route to Las Vegas on Interstate 15, you’ve probably seen the signs pointing to Calico Ghost Town. 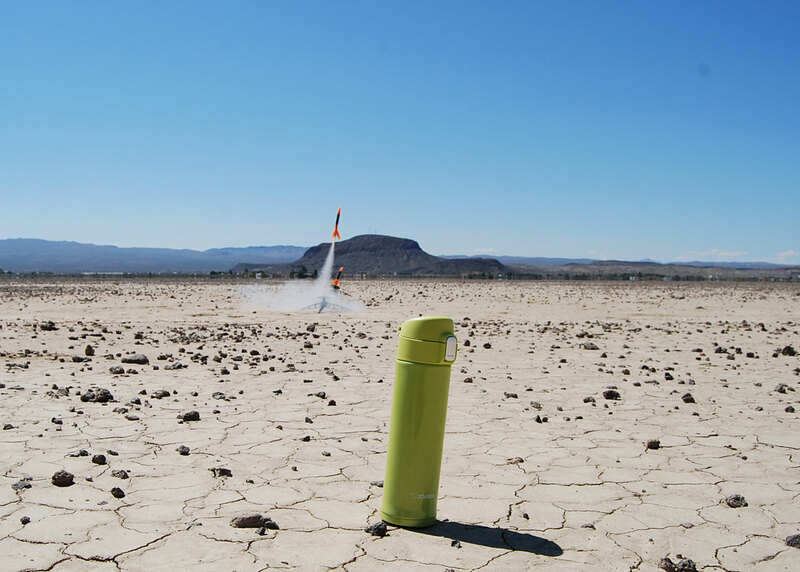 We went to visit Calico too, but we also went to fire off model rockets at a nearby dry lake bed–and I took my Zojirushi Stainless Mug with me. I just thought it would be fun to get the bottle into the shot–doesn’t it look like it could be on another planet? It was typical desert weather; cool and crystal clear when we got there, and warming up a lot by the time the first rockets took off. The ice water that I brought in the bottle helped–a lot. To see the rocket video, click this link. Griddle cooking usually brings up images of a short order cook frying hamburgers, right? Teppanyaki is Japanese griddle cooking and it’s a lot more than hamburgers. Characterized by fresh ingredients in bite sized portions, teppanyaki is a communal way of dining with friends and family because you eat while everyone cooks their own portion on a centrally placed hot griddle. Even at a restaurant where the chef is doing the cooking and doing tricks with his spatulas and building “volcanoes” with a tower of onions, guests are seated with complete strangers and everyone has a good time. Diners wait while the teppanyaki chef juggles pepper shakers, flips shrimp pieces into the air, and deftly slices cubes of steak with astonishing speed. Typical ingredients are cabbage, bean sprouts, onions, bell peppers, shrimp, chicken, steak meat and sausage. Dipping sauces are used for flavoring sometimes, but these little mouthfuls can also be enjoyed with very light seasoning that serve to enhance the original flavors of the ingredients. In the home environment, your electric griddle can replicate the teppanyaki experience. You don’t need to juggle knives to entertain your guests. They will entertain themselves just by being able to cook their own dinners on the tabletop griddle. 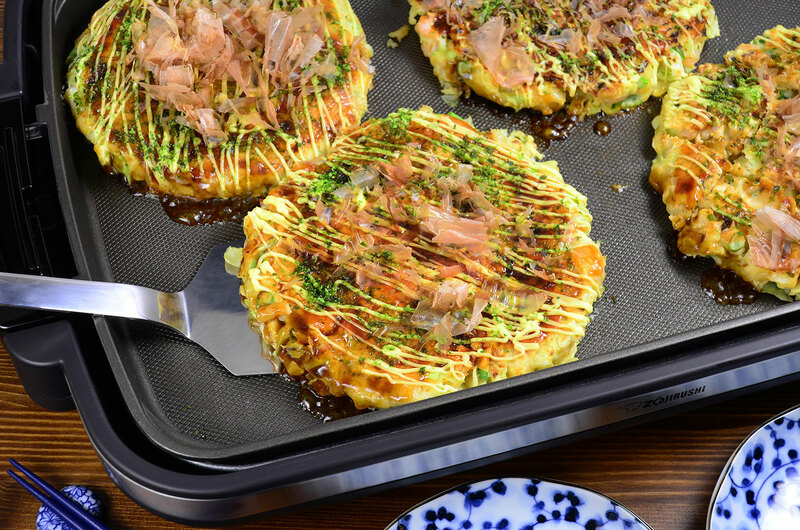 Other typical dishes cooked on the griddle are okonomiyaki and yakisoba, two classic favorites that everyone enjoys making because there really is no wrong way to cook them. Okonomiyaki is a mix of meat, vegetables and batter, in a savory pancake meets pizza kind of dish; while yakisoba is a distinctively Japanese chow mein. Both dishes require the cook to personalize his/her cooking method by the choice of ingredients, order of frying, and use of cooking utensils. No wonder it’s more fun than frying a hamburger! If you ever get the chance, try “iron plate cooking” at home–you’ll feel like an iron chef. It seems as though we were just gearing up for cold weather and holiday parties, and suddenly spring has sprung as if overnight. Time seems to be flying by faster and faster with heavy homework at school, busy days at work and weekends that pass by in a flash of sports games and grocery shopping. It’s amazing we even find time to eat! Much like the New Year, spring is a time for new beginnings and new life. It’s a time to shed the habits and clutter that spent the winter in our homes and make way for the new. If you are anything like us, then you must enjoy a good deep clean this time of year. Amidst the busy days of modern life and spring-cleaning, don’t forget to slow down and share a nice meal with family and friends. At Zojirushi, we understand how hectic life can get. That’s why we spend years developing products that will simplify your life. Our hope is that if you can worry less about what’s going on in the kitchen, you can focus more on what’s happening at the table. At the end of the day, the table is where we all come together; it’s where for an hour or so, we can forget the pressures of the day and enjoy each other’s company. So please, eat! Please, drink! Please, enjoy this spring with loved ones! There is always something worth celebrating! Cheers, Zojirushi. Have you ever noticed a Japanese toy at a museum or at your local Japanese store? Sometimes it’s hard to tell whether it’s folk art, high art or serious craft. Some toys in Japan have been around for centuries and stand the test of time. Their design is built to last and their simplicity is built for the imagination. Something we rarely get to use in this age of social media and video games! Takeuma (竹馬), pronounced ta-keh-ou-ma, for example are Japanese bamboo stilts! They are simple to make, and most variations are strong enough to hold a 6-foot, 200-pound person! They are made simply by binding take(竹) (bamboo) together. Children would play by tying a string to the roots and mounting this as if on an uma(馬) (horse). Making your own toys! Now there’s an idea. Another classic Japanese toy that has found many incarnations in the states is taketombo(竹とんぼ), pronounced ta-keh-tom-boh, or bamboo-copter. This is a bamboo toy helicopter that flies when its shaft is spun. It functions like a spinning top, but in the air. The taketombo originated in China in the year 400 B.C., and is still commonly found in most American toy stores! Can you think of anything else in a toy store that’s been around since the year 400B.C.? 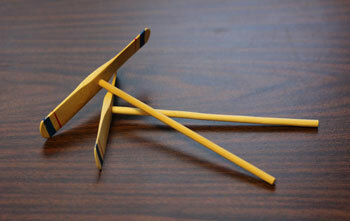 Just like takeuma, making bamboo-copter is fairly easy, but it might be simpler to just buy one. In any case, you should check this ancient idea out. Surprise the children around you with the gift of simplicity and imagination! Happy playing! In Japan, April is the time for a new school year to begin. That’s right, warm spring weather and fragrant cherry blossoms mark the new academic year. It’s hard to imagine going “back to school” without crisp fall apples and leaves on the ground eh? Going back to school is more than just packing a brown bag and strapping on a backpack in Japan. In fact, each April, schools hold an “Entrance Ceremony” for new students. The entrance ceremony is a time for new students to contemplate the year ahead. It also gives shy or young new students a chance to be welcomed by their older schoolmates. This ceremony is often held in a gym or an auditorium where older students and parents sit to welcome the incoming class as they march in for applause. The principal will usually speak along with the homeroom teachers and older student, as well as an incoming student. New students are then led back to their homerooms where they receive textbooks and more information on the year to come. Sounds a bit different than the all-American way of starting school? Let us know what you think in the comments below! 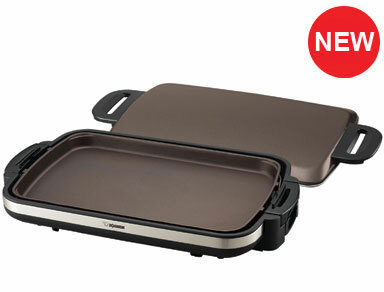 We would like to highlight the Gourmet Sizzler® Electric Griddle (EA-DCC10). This is a very versatile appliance that can make cooking easy and interactive. It features an extra large cooking surface and it’s perfect for breakfast, lunch, or dinner. 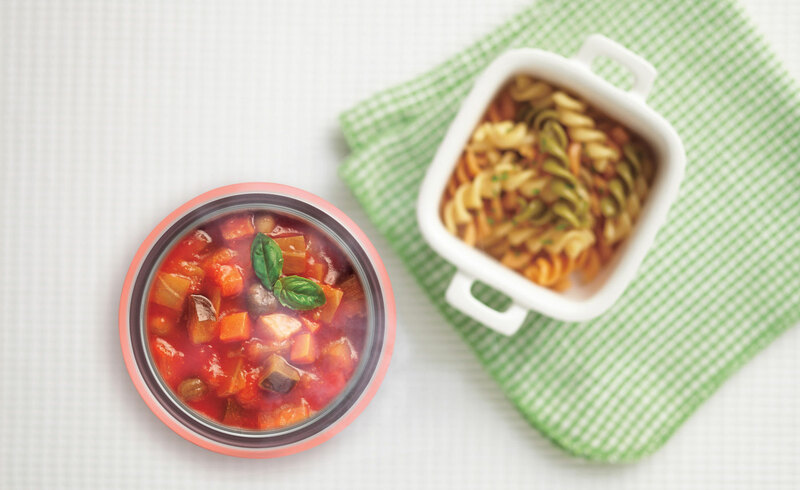 This product is ideal for tabletop cooking. Given the extra large cooking surface and a large lid, sautéing or cooking for large groups can be done quickly with no mess. Curious to see what you could make with this appliance? Check out all the amazing recipes we have for our electric griddles.